We have finally reached the peak of the 2018 fantasy football team power rankings. Today, we will unveil the four best teams from a fantasy football perspective. 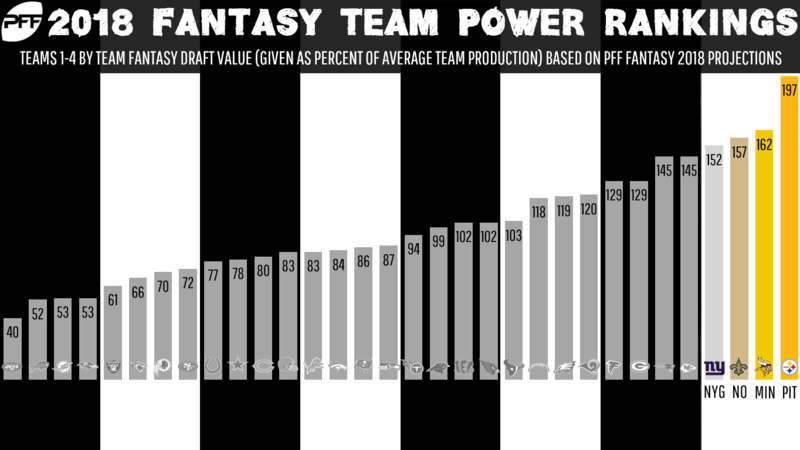 As a reminder, these rankings are based solely on how much value each team brings to the fantasy community on draft day this year. These rankings having nothing to do with how good each team will or won’t be on the real field. The rankings are based on our 2018 player projections, which are accessible with a PFF Edge or PFF Elite membership. New York had one of the worst offenses in the league last year, but some new additions and returning players vault the Giants near the top. The Giants check in at No. 4 on the 2018 fantasy football team power rankings. The Giants have the No. 9 backfield from a fantasy perspective. Barkley has never played a down of NFL football, but we know his talent level and we know he’s in a prime spot to put up massive numbers as a rookie. As a dual-threat running back, Barkley checks all the boxes for fantasy. We have him projected for nearly 350 total touches, over 1,500 total yards, and about 10 touchdowns. The Giants have the No. 3 wide receiver corps from a fantasy perspective. Beckham Jr. played in only four games last year, but he racked up 41 targets, 302 yards, and three scores in those games. We don’t have to do much arm-twisting to get you to know that OBJ is clearly a top-five wide receiver in fantasy once again. He has finished as a top-five scorer at the position every year he has been healthy. With OBJ sidelined, Shepard was in the middle of a breakout year before he, too, was injured. Shepard’s 16-game pace was 86-1,063-3. He’ll take a backseat in the offense with OBJ back in the fold and Barkley now on the roster, but Shepard can still be viewed as a WR3 or flex option in PPR leagues. This should be a high-volume passing offense (Eli Manning ranked second in aimed attempts last year), so there is plenty to go around. The Giants have the No. 6 group of tight ends from a fantasy perspective. As a rookie last year, Engram stepped up in a big way to try to fill the void left by OBJ. His 108 targets ranked second at the position, and he finished the year with a line of 64-722-6 en route to the overall TE5 finish. 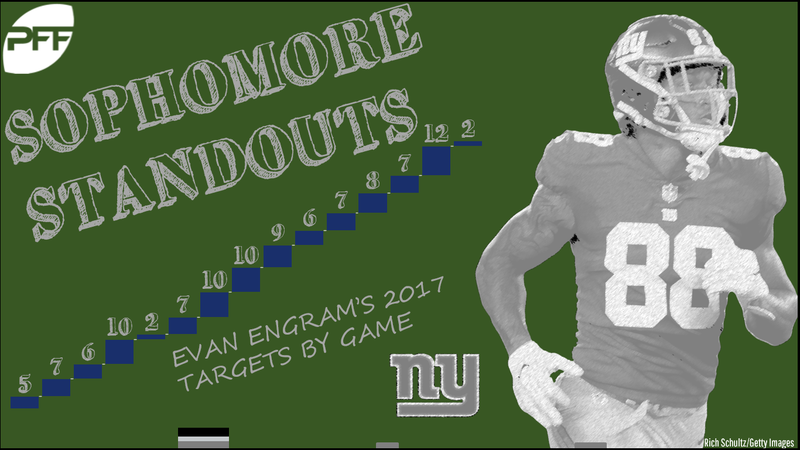 While there are more able bodies in the offense this year, it would not be a role to see Engram’s natural role expand more now that he’s in his second year. You should not expect a drop-off in production. Eli Manning doesn’t need to be drafted in your fantasy league this year. Seemingly overnight, the Saints evolved from a pass-happy offense to a run-first team — and they had the same amount of fantasy success. All of last year’s key players return this year to help the Saints check in at No. 3 on the 2018 fantasy football team power rankings. The Saints have the No. 1 backfield from a fantasy perspective. Ingram (suspended for the first four games) and Kamara will again team up to form an electric backfield. It would be a shock to see them match their 2017 efficiency again, but these two players can clearly rack up the points in a hurry in this offense. Kamara’s 0.64 fantasy points per snap were by far the highest we’ve ever seen in the PFF era (since 2007), and Ingram ranked second last year (0.51). Kamara can be considered a top-six option in PPR leagues thanks to the fact he’ll likely see around 100 targets and 175 rushing attempts. Ingram’s stock took a hit because of his suspension, but when he returns, he’ll lead the backfield in rushing attempts while garnering 3-5 targets per game. Kamara is locked in as an RB1 in PPR, while Ingram can be considered a borderline RB1/high-end RB2 once he returns to the field. The Saints have the No. 7 wide receiver corps from a fantasy perspective. Not only do the Saints have an incredible backfield for fantasy, but they also have one of the five best receivers for fake football in Thomas. Thomas was our third-highest-graded receiver last year (90.6) behind Julio Jones (91.7) and Antonio Brown (91.2). His 139 targets ranked seventh at the position, and he was one of only five receivers to top 100 receptions. Meredith has some appeal as the No. 2 wideout in New Orleans, but he will be pretty far down the target totem pole, so he’ll more likely be a decent bye week flex fill-in option rather than a weekly starter. The Saints have the No. 19 group of tight ends from a fantasy perspective. Watson technically made the cut for this study, but in reality, there’s very little difference in tight end once you get beyond the top 15 or so. The Saints have the No. 13 group of quarterbacks from a fantasy perspective. Brees is a safe bet to produce top-12 numbers at a minimum, with obvious upside for more. He no longer needs to carry the entire offense himself, though, so the days of picking Brees and inking him in as a top-three fantasy quarterback are in the past. What a difference a year makes. In last year’s preseason fantasy team power rankings, the Vikings ranked No. 28. This year? Minnesota checks in at No. 2 on the 2018 fantasy football team power rankings. The Vikings have the No. 6 backfield from a fantasy perspective. Cook’s rookie season was cut far too short, but when healthy (the first four weeks), he had the look of a top-flight fantasy running back. His 74 rushing attempts in that span ranked fifth. His 354 rushing yards ranked third. He ranked ninth in fantasy points. We don’t think that was a fluke, and Cook is projected as a top-10 fantasy running back in 2018. Murray split the backfield with Jerick McKinnon in Cook’s absence last year, and he actually did a good job despite his reputation. Murray scored eight touchdowns from Weeks 5-17, third-best in the NFL. He was the overall RB15 in that span. As Cook’s backup, however, Murray will probably only see 6-8 touches per game. He’s an emergency flex fill-in option, but he is one of the better “handcuffs” in the league (if you like to go that route). The Vikings have the No. 2 wide receiver corps from a fantasy perspective. 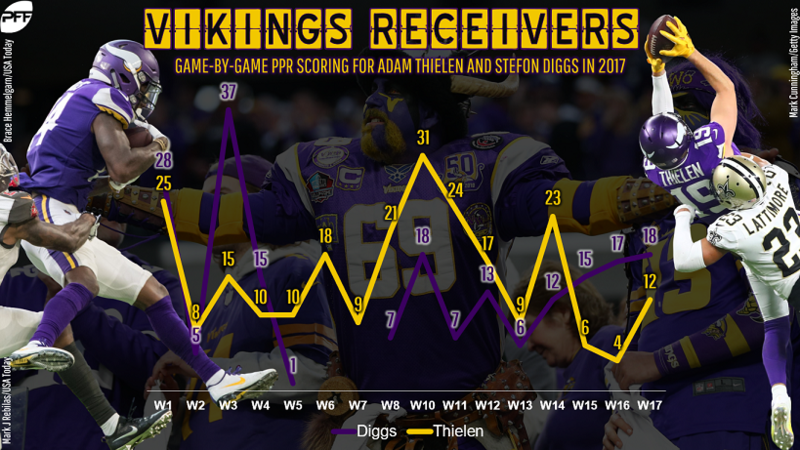 Diggs and Thielen flashed brilliance in the 2016 campaign, but it all came together for the duo in 2017 on a much more consistent basis. Thielen (No. 8) and Diggs (No. 19) both finished as top-20 wideouts last year. Only Detroit’s duo of Golden Tate and Marvin Jones accomplished the same feat. Thielen runs about 50 percent of his routes from the slot — and he is one of the best in the league from that position. His 2.1 yards per route run out of the slot last year ranked tied for third in the NFL. Diggs operates out of the slot on about 25 percent of his routes, and he isn’t far behind in terms of efficiency (1.9 YPRR, tied for ninth). Thielen can again be viewed as a tail-end WR1, while Diggs will be a little streakier but should finish the year as a strong WR2. Both players have week-winning upside. The Vikings have the No. 7 group of tight ends from a fantasy perspective. Rudolph has been a top-10 fantasy tight end in two straight years, including a No. 2 overall finish at the position in 2016. With Cook returning from injury, and Thielen and Diggs eating up the bulk of the targets outside, it’s difficult to project Rudolph to do much more than he did last year. With that said, another season in the range of 60-600-7 is very possible, and Rudolph can again be considered a mid-pack TE1. The Vikings have the No. 6 group quarterbacks from a fantasy perspective. Cousins’ move to Minnesota cannot be viewed as a negative thing from a fantasy perspective. The move undoubtedly makes you like Cousins even more in fantasy. It is hard for Cousins to move up in fantasy, though, because he was the No. 5 overall quarterback last year. We like Cousins as a mid-pack QB1 again in 2018. It will be almost impossible for him to not put up viable numbers in this spot. There’s no surprise here. The loaded Steelers offense checks in at No. 1 on the 2018 fantasy football power rankings. The Steelers have the No. 2 backfield from a fantasy perspective. Bell’s holdout will no doubt scare some fantasy owners away, but nothing about Bell’s situation should scare you away from him in the first few picks of your fantasy draft. Bell is the league’s No. 1 workhorse — he joined the “400 Club” among running backs last year with 407 total touches — and he could flirt with that number again this year (although closer to the 375 range is more realistic). You cannot pass up 375-plus touches in fantasy. The Steelers have the No. 1 wide receiver corps from a fantasy perspective. – 1,200+ receiving yards ???? Smith-Schuster was fantastic as a rookie, and he excelled out of the slot, where he gained 2.1 YPRR, third-best among wideouts. He finished the year with a 58-917-7 line, good for the No. 21 overall finish among receivers. We have Smith-Schuster projected to break the 1,000-yard mark in 2018 while putting up fantasy WR2 numbers again. There are no fantasy-relevant tight ends on the Steelers that you need to know about for 2018 drafts. The Steelers have the No. 8 group of quarterbacks from a fantasy perspective. Roethlisberger has never been an elite fantasy quarterback — thanks in large part to the fact there are essentially two version of Big Ben — but he’s surrounded by arguably the best wideout and best running back and he’s projected to rank first in pass attempts this year, so it would be a surprise to see him fail. We have Roethlisberger projected as a mid-pack QB1 in 2018.